Native to south Portugal, east to Iran. Common relatives include agapanthus, alstroemeria, clivia, nerine and daffodil. Flowers are flat with narrow cup (corona), 4-8 per stem. Plant is a herbaceous perennial from a bulb, plant classed as a monocotyledon, leaves mostly parallel veined. Flower fragrance is strong, sweet. Store at 32-33 F for up to 10 days, 36-38 F for up to 8 days, store dry or wet but keep stems upright to prevent stem bending (geotropism). When held wet or dry between 32 and 50F, no difference in vaselife was noted between wet and dry at a given temperature. However, there was an advantage for wet holding when held at 55F. Therefore, dry storage/transport is recommended unless high temperatures (>50F) are possible. Some references say this plant was named after Narcissus of Greek mythology, who turned into this plant after killing himself because he could not reach his reflection in a pool. Some bulbs used for producing paperwhite cut flowers are grown in Israel and the cultivars used include ‘Sheleg’ and ‘Ziva’. Others are produced in countries such as The Netherlands. Narcissus is a Greek name said to be derived from “narke” (numbness, torpor) in reference to its narcotic properties. Very often grown in homes using just gravel and water. The bulbs contain essentially all of the nutrition and therefore only need water, light and carbon dioxide (from air) to grow and flower. 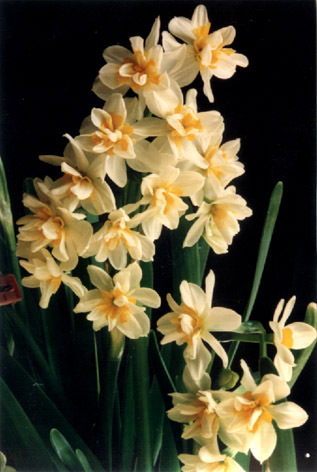 Van Doorn (1997) demonstrated that when freshly cut daffodils are placed in the same tap water with freshly cut roses, the roses wilted very rapidly due to the slime that is exuded from the cut stem ends of the daffodil. However, if a germicide was added to the water such as bleach, this negative effect on roses can be eliminated. It is therefore important to hydrate daffodils in a solution that contains a germicide such as found in flower foods or the bleach example noted above.